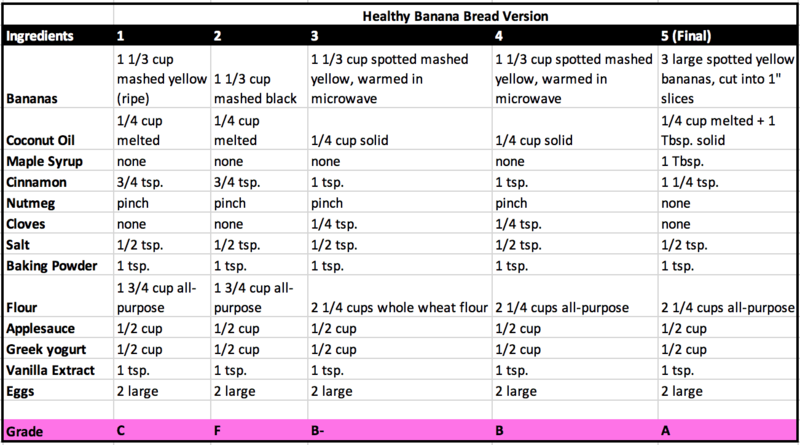 This Healthy Banana Bread is lower in sugar and higher in protein than most banana bread recipes. We tried five different recipes to get here, so we hope you like it. If you don’t, we’ll just go back to crying into our pillow. You wouldn’t think it would be all that hard to develop a recipe for a low sugar healthy banana bread. But it took five tries until I finally came up with something I think you’ll love. 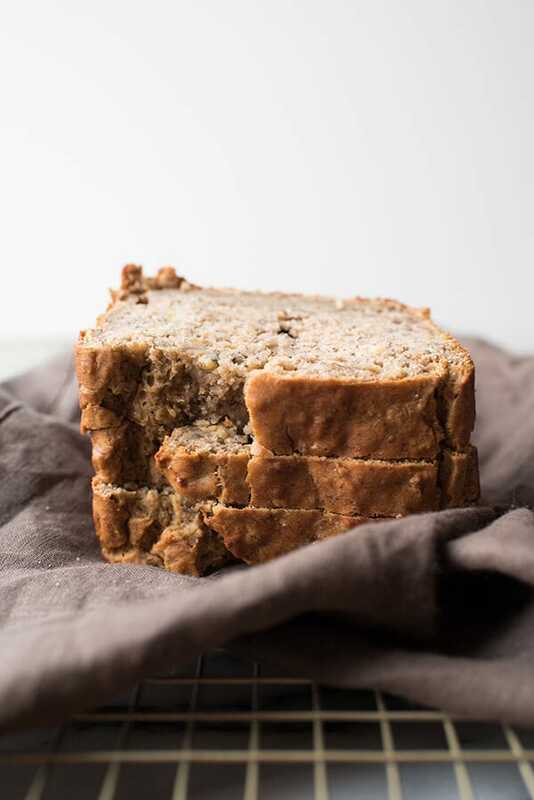 The final version of my super healthy banana bread incorporates caramelized bananas, Greek yogurt, applesauce, and just a touch of maple syrup to bring out the other flavors. I whisked the dry ingredients together, all the wet ingredients together, and combined them. It needed more cinnamon and more sweetness. It was fine. It wastThe Stone Temple Pilots of banana bread. Dense, not super flavorful, not sweet, basically like bread. It was good if you warmed it up and drizzled honey on top. Not the best, not the worst. Instead of using ripe, yellow, unspotted bananas, I used almost black bananas. These super spotted, super sugary bananas would certainly result in a sweeter loaf, right? Nope. Most of the bananas congealed together in a mass at the bottom of the loaf. It tasted undercooked and gummy, even though it was in the oven for-ev-er. Sad face. I went back to the original healthy banana bread recipe, used spotted yellow bananas that I warmed up for 30 seconds in the microwave, swapped the all-purpose flour for whole wheat flour (because that would ostensibly make banana bread loaf a bit healthier) and increased the flour to 319 grams (2¼ cups). I also stopped melting the coconut oil and started mixing it in after combining the wet and dry ingredients. I increased the cinnamon to 1 tsp. and added ¼ tsp. cloves. The whole wheat flour overwhelmed the other flavors and on balance, the bread still wasn’t flavorful enough. This version was the same as #3, but used all-purpose flour instead of whole wheat flour. But it tasted muted. Ugh. No one wants mime bread. After four attempts to make a healthy banana bread that was lower in sugar, I did a bit more investigating and found that while many recipes have so much sugar that it masks the taste of everything else, sugar, like salt, is a flavor enhancer. The trick is to add just enough. To keep this healthy banana bread recipe still relatively low in sugar, I caramelized the bananas. I sliced the just slightly spotted yellow bananas into 1″ medallions and placed them and 1 tablespoon of coconut oil into a nonstick skillet. I turned the heat to medium low, stirring the mixture until the bananas had caramelized. I then added one tablespoon of maple syrup and cooked the mixture until the bananas were very soft. I added ¼ tsp. cinnamon and cooked the mixture for one more minute. I poured the banana bread batter into a bowl, added the other wet ingredients and the remaining cinnamon. For kicks, I toasted ½ cup of walnuts and added those to the dry mixture. I combined everything and poured the final mixture into a nonstick loaf pan and baked it for 55 minutes at 350° F. When I stuck a knife inside, it came back mostly clean, and the internal temp read 170°F. 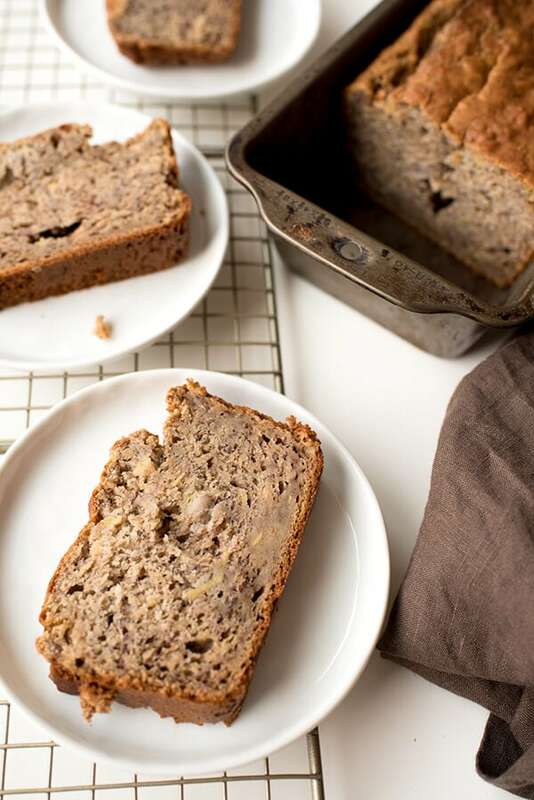 This healthy banana bread was moist, light, and super flavorful. It tasted of bananas and cinnamon and the crust was just ever so crunchy. And, despite having tested multiple other loaves over the week, it was devoured quickly by my taste testers. 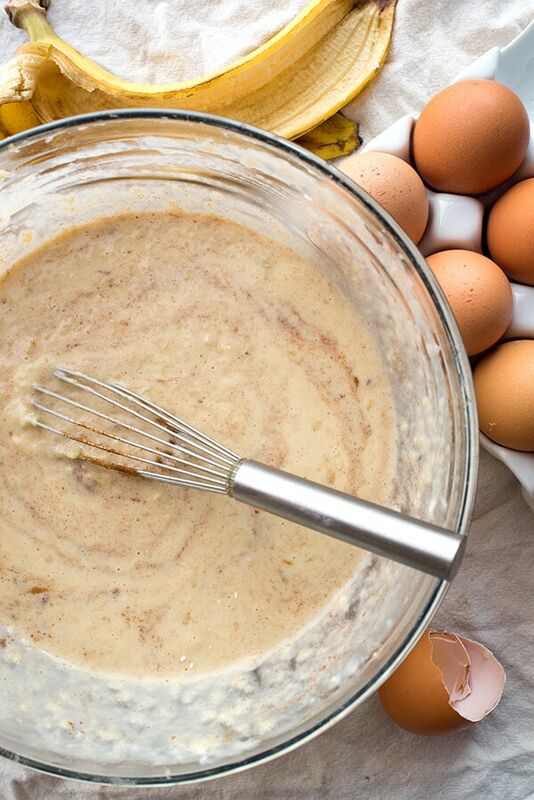 This healthy banana bread recipe is lower in sugar than most banana bread recipes. Preheat oven to 350°F. Spray 9x5 loaf pan with nonstick spray. Place sliced bananas and coconut oil in nonstick skillet and turn heat to medium-low. Heat, stirring continually, until coconut oil has melted and is mostly absorbed. About 3-5 minutes. Add maple syrup. Cook, stirring continually, until absorbed. Add ¼ tsp. cinnamon mix until mixture is very soft and no longer sticking to pan. Remove pan from heat and pour banana mixture into large bowl. Set aside. Combine salt, baking powder, and flour in medium mixing bowl. Set aside. Add applesauce, yogurt, vanilla, and cinnamon to bananas. Mix until fully combined. Add eggs. Mix until fully combined. Add flour mixture to banana mixture. Stir until combined and no dry flour remains. Add walnuts if desired. Add remaining ¼ cup of coconut oil to mixture, one tablespoon at a time. Mix until combined. 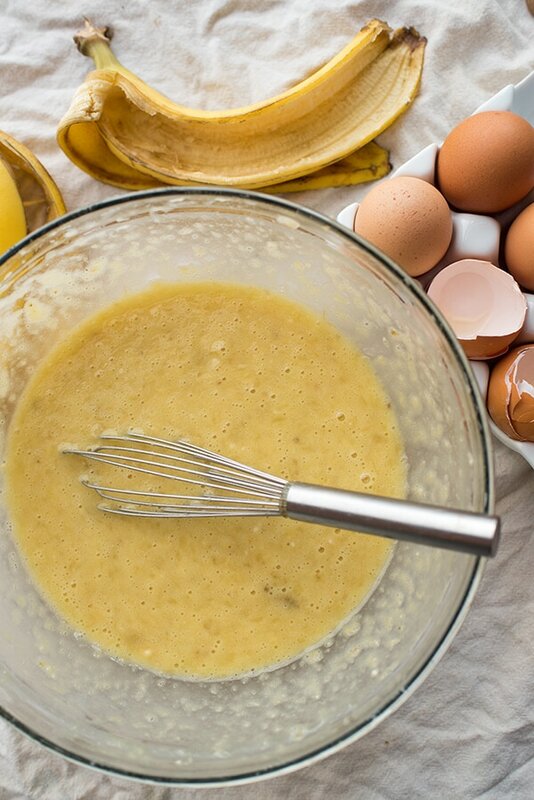 Pour banana mixture into prepared loaf pan. Bake for 50-55 minutes or until knife comes out clean or internal temp is 170°F. You can swap all-purpose flour for whole wheat flour. 319 grams of either will work. I usually bake with coarse kosher salt. I don't recommend that for this recipe. Use fine salt instead. It looks delicious! I’m glad you found a version that you really loved after all those trials, that is the best feeling! Can’t wait to try it out! 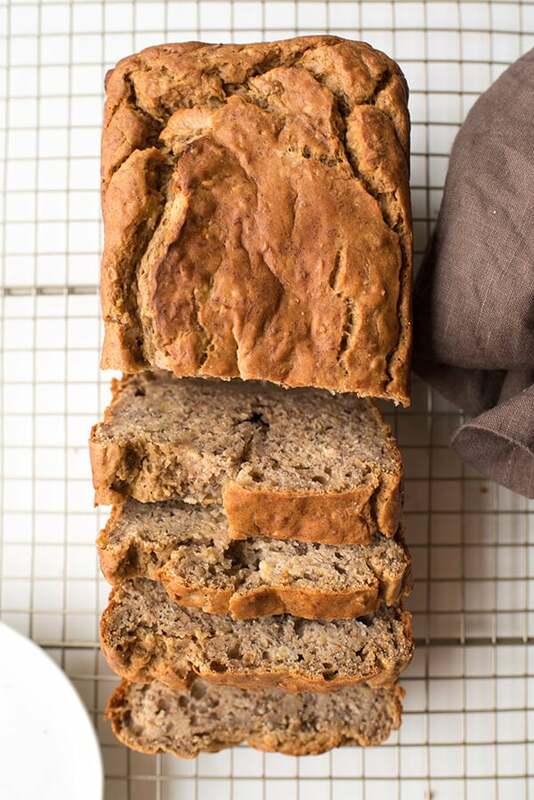 I absolutely LOVE banana bread and your version looks absolutely delish! Such gorgeous photography as well! It was! I ate a LOT of banana bread last week! And, I’m glad to hear that. I was like nooooooo don’t use the sugar!!! But, it really made a difference. I love banana bread! 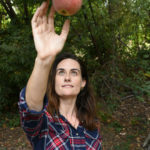 Thanks for sharing a healthy version … most of the recipes I use are ages old and not necessarily concerned with health issues! You’re very welcome! I was excited to challenge myself with this recipe and I look forward to hearing how it turns out for you! 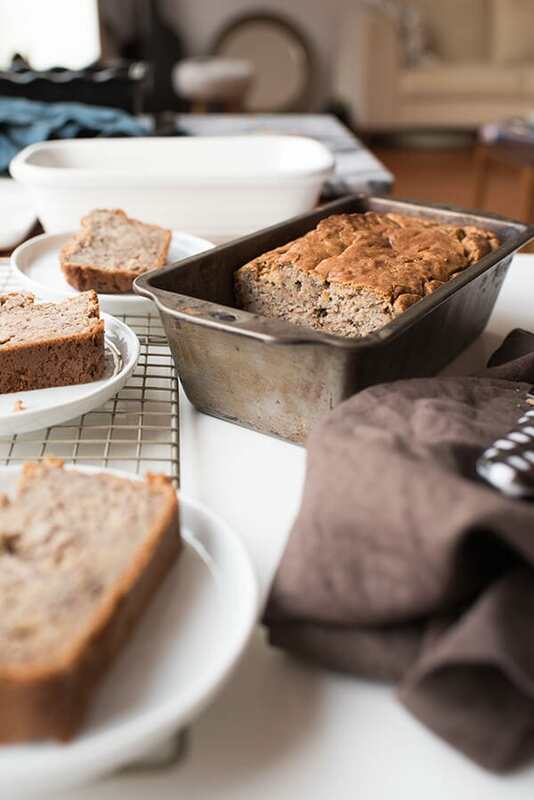 I love banana bread in general and to make a healthy one is a double pleasure! I love making banana bread! The best! I love how you described your whole testing process! The Stone Temple Pilots of banana bread… LOL!!!!! Priceless. I am the Master of Banana Bread in my family and circle of friends, I have many different recipes that I’ve made throughout the years. Your’s is, by far, THE BEST !!!! I made a loaf yesterday for my family of 4 and it did not last the day. Thanks for all of your work and effort. and great explanation. I am also the mother and master chef for my 20 y/o vegan son. I tried your recipe, which I converted to vegan friendly, by swapping our the eggs for 2 flax eggs (2 TBSP ground flax seed to 6 TBSP water let sit for a few minutes until it absorbs) and also swapped the Greek yogurt for Silk Almond milk yogurt. I had to use vanilla flavored, as I could not find plain. So the vegan version was sweeter. I added unsalted roasted pumpkin seeds and sunflower seeds, to the top of the loaf before baking, for the vegan, for extra protein. Thanks for making us all very happy.